Abstract: It is well known that the addition of carbon nanotubes (CNTs) can strongly affect the thermomechanical and electrical properties of the polymer into which they are dispersed. The common solvent mixing dispersion method of functionalized CNTs and polymer composites can improve thermal, mechanical, and electrical properties. In this study, functionalized single-walled CNTs (COOH-SWCNTs) and poly(methyl methacrylate) were used to fabricate the polymer nanocomposites using a common solvent dispersion mixing method. The homogenous dispersion of COOH-SWCNTs in the composites resulted in improved thermomechanical properties of these composites; this was analyzed using scanning electron microscopy. In the last two decades, the polymer nanocomposites have drawn desirable interest in industry and research.1–3 The carbon nanotubes (CNTs) have exceptional properties of electrical,4–5 thermal,5 and mechanical, in combination with their low mass density, large aspect ratio, and higher surface area per mass which would make them an ideal reinforcing agent to impart these multifunctional properties to the polymers.6–8 Consequently, the large surface area of polymer nanocomposite materials fully exposes to specific functionalities, while the structure of the material maintains with desired mechanical properties. In this study, we have focused on incorporating functionalized SWCNT (COOH-SWCNT) into PMMA polymer matrix. SWCNT/PMMA composites are useful for a wide range of applications from household to automobile in day-to-day life. The main focus of this study is to achieve a homogeneous dispersion of SWCNT in polymer matrix via common solvent dispersions34 and to improve multifunctional properties. The composites were fabricated with various COOH-SWCNT loadings and their thermal, mechanical, and electrical properties were measured. The composites at 5 wt% COOH-SWCNT loading enhanced mechanical and electrical properties for a wide range of industrial application. COOH-SWCNTs used in this work were purchased from Cheaptubes, Inc., (Brattleboro, VT, USA) with a relative purity >95 wt%. The dimension of the SWCNTs was 5–10 nm in outer diameter, 1–5 nm in inner diameter, and 5–30 μm in length. The polymer matrix used in this work – PMMA – was purchased from Thermo Fisher Scientific, Waltham, MA, USA (includes Thermo Scientific and Fisher Scientifc). To reduce aggregation, a small amount of COOH-SWCNTs was dispersed first in chloroform and underwent mechanical stirring for 1 hour, followed by tip sonication (in a water bath) for 2 hours. The PMMA was dispersed in chloroform and underwent mechanical stirring for 1 hour, followed by bath sonication for 2 hours. The two above dispersed solutions sharing common solvent chloroform, but containing COOH-SWCNTs and PMMA polymer, respectively. The PMMA solution was added to COOH-SWCNT solution to achieve the desired final weight percent of COOH-SWCNTs. The mixture then was bath sonicated for 2 hours to facilitate dispersion. Finally, chloroform was evaporated and then degassed under a modest vacuum. Here, we used chloroform as the common solvent that would be the optimum solvent35 to disperse COOH-SWCNTs in the PMMA polymer matrix. The microstructure of composite scaffold was imaged using scanning electron microscopy. Nova Nano 630 was used to obtain high-resolution scanning electron microscope images. The tensile stress (σ) was measured as a function of tensile strain (∈) at a rate of 1 mm/s at room temperature with a 5 N load cell using dynamic mechanical analysis system (TA Instruments). For the tensile measurements, including the testing of plastic sheets with the thickness <0.25 mm, the American Society for Testing and Materials (ASTM) standard ASTM D 882 was followed. Differential scanning calorimetry (DSC) measurements were carried out with a DSC-204 F1 (Netzsch) at a heating rate of 5°C/min. Thermogravimetric analysis was carried out under atmospheric N2 over a temperature range of 25°C–800°C using a TG-209F (Netzsch) at a heating rate of 5°C/min. For electrical conductivity measurements of the composite, copper foil leads were connected or attached to the short ends of the rectangular composites with silver paste, and resistance was measured using a two-probe contact direct current method. The first main challenge is to separate the SWCNTs from their initial aggregated assemblies, which is achieved by local shear forces and functionalization. The simple manual mixing of SWCNTs with PMMA polymer matrix does not create a local shear force and, therefore, leads to nonuniform dispersion of SWCNTs inside PMMA polymer matrix. For effective separation of SWCNT bundles, physical and chemical approaches such as mechanical stirring, sonication, and surface functionalization have been employed. Briefly, the fabrication of composites, the dispersion of COOH-SWCNTs could be aided by the introduction of a common solvent – an organic solution of chloroform36 that dissolves PMMA easily and at the same time allows uniform dispersion of COOH-SWCNTs. The two solutions are shared via common solvent chloroform containing COOH-SWCNTs and PMMA polymer, respectively, undergo mechanical stirring for 1 hour followed by sonication process for 2 hours. Following that, the two solutions were mixed for a further 2-hour bath sonication. Finally, with the complete evaporation of the solvent, COOH-SWCNTs would be left well dispersed in polymer matrix. Here, chloroform was used as the common solvent that would be the optimum solvent36 to disperse COOH-SWCNTs in the PMMA polymer matrix. The PMMA polymer may be covalently bonded to the COOH-SWCNTs surface, and this will lead to stronger interfacial interactions. It is important to study and understand different functional groups on the composites to examine the structure of composites. 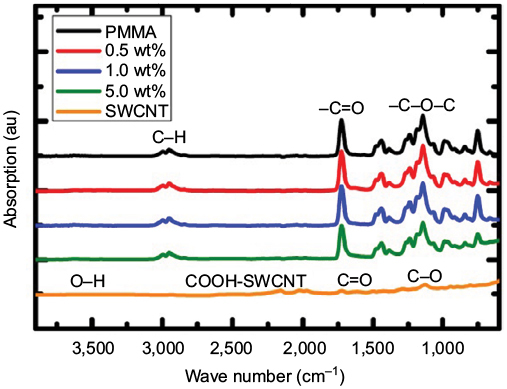 Figure 1 Fourier transform infrared spectroscopy spectra of the PMMA, SWCNT, and COOH-SWCNT/PMMA composites. Abbreviations: PMMA, poly(methyl methacrylate); SWCNT, single-walled carbon nanotube; COOH-SWCNT, functionalized SWCNT. The fracture surface morphology of composites at two different COOH-SWCNTs loading is shown in Figure 2. The dispersion and aspect ratio of COOH-SWCNTs, porosity play a critical role in improving thermomechanical and electrical properties. 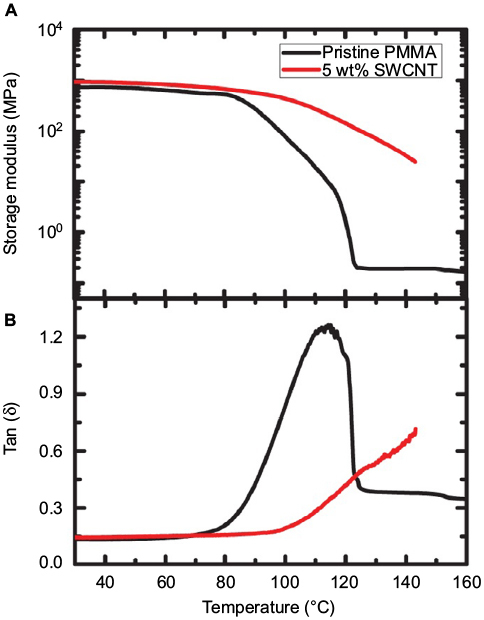 The homogeneous dispersion of modified SWCNTs is achieved at 0.5 wt% COOH-SWCNT loading (Figure 2), and highly packed homogeneous dispersion is observed at 5 wt% COOH-SWCNT loading (Figure 2). The scanning electron microscopy (SEM) micrographs of composites confirm the good homogeneous distribution of the COOH-SWCNTs and indicate a fine dispersion at the microscale. The homogeneous dispersion of modified SWCNTs covalently bonded to the PMMA polymer would improve thermal, mechanical, and electrical properties due to the stronger interfacial interactions between polymer and SWCNTs. Figure 2 Scanning electron microscopy micrographs of the SWCNT/PMMA composites (A) 0.5 wt%–500 nm, (B) 0.5 wt%–500 nm, (C) 0.5 wt%–1 μm, (D) 0.5 wt%–5 μm, (E) 5 wt%–5 μm, and (F) 5 wt%–10 μm. Abbreviations: PMMA, poly(methyl methacrylate); SWCNT, single-walled carbon nanotubes; wt, weight. The mechanical characterization was carried out for the pristine PMMA and COOH-SWCNTs/PMMA composites. The composite samples used for all mechanical measurements were rectangular with an average thickness of 100–150 µm. Figure 3A shows the stress–strain curve for pristine PMMA and COOH-SWCNT/PMMA composites, and the first 0%–5% strain range was considered as a linear region for tensile modulus measurements. The tensile modulus of pristine PMMA showed about 450 MPa; the COOH-SWCNT/PMMA composites were improved tensile modulus by ~300% (Figure 3B). 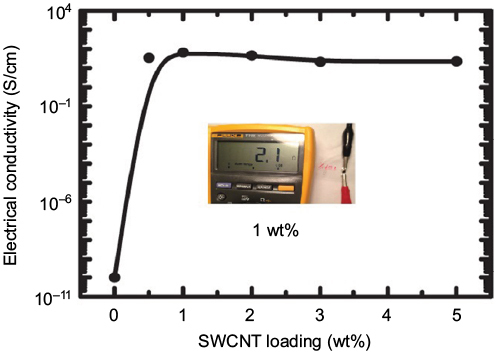 The ultimate tensile strength of composites increased suddenly at 0.5 wt% and then increased slowly as the function of SWCNT loading (Figure 4A). Notes: (A) Tensile stress (σ) versus tensile strain (ε curves); (B) tensile modulus (E) of the COOH-SWCNT/PMMA composites as the function of COOH-SWCNT loading. Insert graph shows linear region. Abbreviations: CNT, carbon nanotube; COOH-SWCNT, functionalized single-walled carbon nanotube; PMMA, poly(methyl methacrylate); wt, weight. Figure 4 The mechanical characteristics of COOH-SWCNT/PMMA composites. Notes: (A). The UTS of the COOH-SWCNT/PMMA composites with COOH-SWCNT loading. 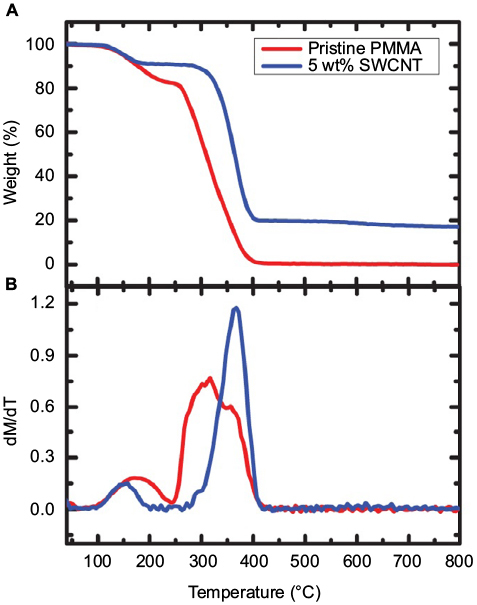 (B) The tensile strain of the COOH-SWCNT/PMMA composites with modified COOH-SWCNT loading. Abbreviations: COOH-SWCNT, functionalized single-walled carbon nanotube; PMMA, poly(methyl methacrylate); UTS, ultimate strength. The ultimate tensile strength of composites at 5 wt% COOH-SWCNT loading was enhanced by ~3 (300%) times higher compared to the pristine PMMA. 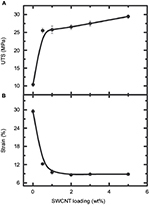 The tensile strain (elongation) decreased from 30% to 9% at 5 wt% COOH-SWCNT loading (Figure 4B). The higher COOH-SWCNT loading may lead to dense packing with polymer due to the stronger interfacial interaction between modified SWCNT and polymer. The composite at 5 wt% showed higher modulus (E), higher ultimate tensile strength, and higher stiffness compared to pristine polymer due to more tightly packed polymer and modified SWCNT morphology. The pristine polymer showed a higher stretching (larger strain), and the stretching behavior becomes significantly lower due to the higher brittleness at 5 wt% COOH-SWCNT loading. As a result, 5 wt% COOH-SWCNT loading seems optimum for modified SWCNT loading for smart industrial composite material. To explain the main origin of mechanical enhancement of these nanocomposites, we examined composite glass transition and stiffness, both of which lead to enhance modulus (E) by using DSC analysis and dynamic mechanical analysis. The DSC thermograms (considered second runs to erase any effect of thermal history) is shown in Figure 5. For the pristine PMMA, the glass transition temperature (step in heat flow and calculated Tg as the midpoint of the extrapolated heat flow) appeared at 96.5°C. The glass transition temperature of composites increases ~1°C at 5 wt% COOH-SWCNT loading and shows that no significant change is observed. Figure 5 Differential scanning calorimetry measurements of pristine PMMA and COOH-SWCNT/PMMA composites with the function of modified SWCNT loading. Abbreviations: COOH-SWCNT, functionalized single-walled carbon nanotube; PMMA, poly(methyl methacrylate); wt, weight. The COOH-SWCNTs induced constrained thermal motion of polymer through the altering glass transition temperature of the polymer. The viscoelastic properties (glass transition temperature [tan δ], storage modulus) of COOH-SWCNT/PMMA composites were examined from the dynamic mechanical analysis measurements (Figure 6B). The glass transition temperature of the pristine PMMA showed at 113°C, and the glass transition temperature shifted 10°C to higher temperature for COOH-SWCNT/PMMA composite at 5 wt% COOH-SWCNT loading. Further, the storage modulus (E′) of composite (5 wt%) increased compared to the pristine PMMA (Figure 6A) at room temperature. The modulus of the pristine PMMA and COOH-SWCNT/PMMA composite (at room temperature) was closely comparable to the tensile modulus measured from the tensile test (Figure 3B). 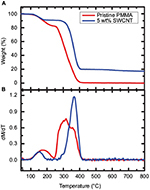 Figure 6 The glassy behavior of COOH-SWCNT/PMMA composites. Notes: (A) The storage modulus versus temperature measurements showed that the modified SWCNT extended mechanical integrity of composites above the polymer melting temperature. (B) Damping ratio (tan δ) versus temperature also showed an enhancement in melting transition temperature of the composites. Abbreviations: PMMA, poly(methyl methacrylate); SWCNT, single-walled carbon nanotube. The pristine PMMA started fracturing at lower temperature due to the softness of polymer (softer backbone), whereas the mechanical fracture of composite shifted to a higher temperature, which suggested that modified SWCNT acted as a stronger reinforcement (mechanical integrity) to the pristine polymer. The modified SWCNTs restricting the polymer motion led to increasing the stiffness of the composite material and contributed to mechanical reinforcement. 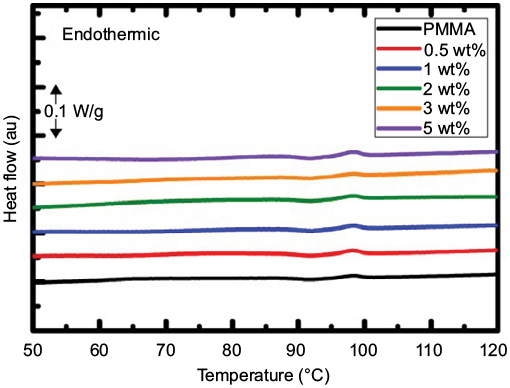 To elucidate COOH-SWCNT/PMMA composites’ thermal stability, composite thermal stability was also examined using the thermogravimetric analysis shown in Figure 7A. The mass loss of polymer in composites associated with burning off reduced in the presence of modified SWCNTs. 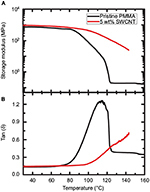 The rate of mass loss showed that degradation temperature of composites shifted to a higher temperature in the presence of COOH-SWCNTs (Figure 7B). The thermal stability was improved by 50°C for composites at 5 wt% modified SWCNT loading. The composites at 5 wt% COOH-SWCNT loading left 18% weight even at 800°C, and this might be due to nanoconfinement of polymer coating on COOH-SWCNTs. Notes: (A) Thermogravimetric analysis of PMMA, and COOH-SWCNT/PMMA composites under a nitrogen atmosphere. The mass loss in polymer associated with burning off polymer reduced in the presence of the modified SWCNTs; (B) examination of the rate of mass loss showed that decomposition of composites significantly shifted to higher temperature with the modified SWCNT loading. The electrical conductivity was found to be 1×10−10 S/cm for pristine PMMA, and the conductivity significantly increased 34 S/cm at 0.5 wt% COOH-SWCNT loading (Figure 8). It is believed that the percolation threshold was established at <0.5 wt% COOH-SWCNT loading, and significantly (1500%) higher electrical conductivity was observed. The increase in conductivity was observed up to 1 wt% COOH-SWCNT loading. The increase in conductivity may be due to the stronger interfacial interaction between SWCNT and polymer. The conductivity started to decrease above 1 wt% COOH-SWCNT loading, and the conductivity becomes constant (20 S/cm) up to 5 wt% COOH-SWCNT loading. The decline in conductivity may be due to higher contact resistance between CNT junctions (CNT–CNT). Figure 8 Electrical conductivity of COOH-SWCNT/PMMA composites with the function of modified SWCNT loading. Abbreviations: COOH-SWCNT, functionalized single-walled carbon nanotubes; PMMA, poly(methyl methacrylate); wt, weight. In this study, we fabricated the composites of COOH-SWCNT/PMMA using a common solvent dispersion method that would be useful to overcome some limitations in the smart material industry. The tensile modulus and ultimate tensile strength of these composites were improved ~300% over the pristine PMMA sample. The electrical conductivity of composites significantly increased 34 S/cm at 1 wt% COOH-SWCNTs loading. The modified SWCNTs reduced the thermal motion of polymer, resulting in an extension of mechanical structural integrity. The COOH-SWCNT/PMMA composites were thermally stable. The fabrication and characterization of COOH-SWCNT/PMMA composite smart materials are of great interest against optical and aerospace industrial applications. This work was supported by the Department of Physics at Worcester Polytechnic Institute (WPI), Worcester, USA. Breuer O, Sundararaj U. Big returns from small fibers: a review of polymer/carbon nanotube composites. Polym Composite. 2004;25(6):630–645. Moniruzzaman M, Winey KI. Polymer nanocomposites containing carbon nanotubes. Macromolecules. 2006;39(16):5194–5205. Marx W, Barth A. Carbon nanotubes – a scientometric study. Phys Status Solidi B. 2008;245(10):2347–2351. Islam MF, Milkie DE, Kane CL, Yodh AG, Kikkawa JM. Direct measurement of polarized absorption cross-section of single wall carbon nanotubes. Abstr Pap Am Chem S. 2004;228:U491–U491. Johnston DE, Islam MF, Yodh AG, Johnson AT. Electronic devices based on purified carbon nanotubes grown by high-pressure decomposition of carbon monoxide. Nat Mater. 2005;4(8):589–592. Bryning MB, Islam MF, Kikkawa JM, Yodh AG. Very low conductivity threshold in bulk isotropic single-walled carbon nanotube-epoxy composites. Adv Mater. 2005;17(9):1186–1191. Kashiwagi T, Du FM, Douglas JF, Winey KI, Harris RH, Shields JR. Nanoparticle networks reduce the flammability of polymer nanocomposites. Nat Mater. 2005;4(12):928–933. Gui XC, Li HB, Zhang LH, et al. A facile route to isotropic conductive nanocomposites by direct polymer infiltration of carbon nanotube sponges. ACS Nano. 2011;5(6):4276–4283. Vigolo B, Penicaud A, Coulon C, et al. Macroscopic fibers and ribbons of oriented carbon nanotubes. Science. 2000;290(5495):1331–1334. Coleman JN, Khan U, Blau WJ, Gun’ko YK. Small but strong: a review of the mechanical properties of carbon nanotube-polymer composites. Carbon. 2006;44(9):1624–1652. Kobashi K, Nishino H, Yamada T, Futaba DN, Yumura M, Hata K. Epoxy composite sheets with a large interfacial area from a high surface area-supplying single-walled carbon nanotube scaffold filler. Carbon. 2011;49(15):5090–5098. Kang IP, Schulz MJ, Kim JH, Shanov V, Shi DL. A carbon nanotube strain sensor for structural health monitoring. Smart Mater Struct. 2006;15(3):737–748. Pham GT, Park YB, Liang Z, Zhang C, Wang B. Processing and modeling of conductive thermoplastic/carbon nanotube films for strain sensing. Compos Part B-Eng. 2008;39(1):209–216. Kim HM, Kim K, Lee CY, et al. Electrical conductivity and electromagnetic interference shielding of multiwalled carbon nanotube composites containing Fe catalyst. Appl Phys Lett. 2004;84(4):589–591. Yuen SM, Ma CCM, Chuang CY, et al. Effect of processing method on the shielding effectiveness of electromagnetic interference of MWCNT/PMMA composites. Compos Sci Technol. 2008;68(3–4):963–968. Huang YL, Yuen SM, Ma CCM, et al. Morphological, electrical, electromagnetic interference (EMI) shielding, and tribological properties of functionalized multi-walled carbon nanotube/poly methyl methacrylate (PMMA) composites. Compos Sci Technol. 2009;69(11–12):1991–1996. Capadona JR, Van Den Berg O, Capadona LA, et al. A versatile approach for the processing of polymer nanocomposites with self-assembled nanofibre templates. Nature Nanotechnol. 2007;2(12):765–769. Miaudet P, Derre A, Maugey M, et al. Shape and temperature memory of nanocomposites with broadened glass transition. Science. 2007;318(5854):1294–1296. Ci L, Suhr J, Pushparaj V, Zhang X, Ajayan PM. Continuous carbon nanotube reinforced composites. Nano Lett. 2008;8(9):2762–2766. Cheng QF, Bao JW, Park J, Liang ZY, Zhang C, Wang B. High mechanical performance composite conductor: multi-walled carbon na006Eotube sheet/Bismaleimide nanocomposites. Adv Funct Mater. 2009;19(20):3219–3225. Ma WJ, Liu LQ, Zhang Z, et al. High-strength composite fibers: realizing true potential of carbon nanotubes in polymer matrix through continuous reticulate architecture and molecular level couplings. Nano Lett. 2009;9(8):2855–2861. Shim BS, Zhu J, Jan E, et al. Multiparameter structural optimization of single-walled carbon nanotube composites: toward record strength, stiffness, and toughness. ACS Nano. 2009;3(7):1711–1722. Zeng Y, Ci LJ, Carey BJ, Vajtai R, Ajayan PM. Design and reinforcement: vertically aligned carbon nanotube-based sandwich composites. ACS Nano. 2010;4(11):6798–6804. Geng HZ, Rosen R, Zheng B, et al. Fabrication and properties of composites of poly(ethylene oxide) and functionalized carbon nanotubes. Adv Mater. 2002;14(19):1387–1390. Sennett M, Welsh E, Wright JB, Li WZ, Wen JG, Ren ZF. Dispersion and alignment of carbon nanotubes in polycarbonate. Appl Phys a-Mater. 2003;76(1):111–113. Shofner ML, Khabashesku VN, Barrera EV. Processing and mechanical properties of fluorinated single-wall carbon nanotube-polyethylene composites. Chem Mater. 2006;18(4):906–913. Ebbesen TW, Lezec HJ, Hiura H, Bennett JW, Ghaemi HF, Thio T. Electrical conductivity of individual carbon nanotubes. Nature. 1996;382(6586):54–56. Treacy MMJ, Ebbesen TW, Gibson JM. Exceptionally high Young’s modulus observed for individual carbon nanotubes. Nature. 1996;381(6584):678–680. Benoit JM, Gilmour CC, Mason RP. 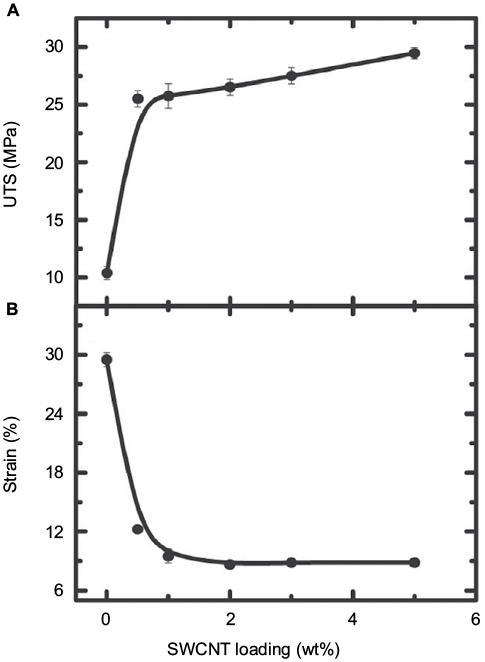 The influence of sulfide on solid-phase mercury bioavailability for methylation by pure cultures of Desulfobulbus propionicus (1pr3). Environ Sci Technol. 2001;35(1):127–132. Dai JF, Wang Q, Li WX, Wei ZQ, Xu GJ. Properties of well aligned SWNT modified poly (methyl methacrylate) nanocomposites. Mater Lett. 2007;61(1):27–29. Skakalova V, Kaiser AB, Dettlaff-Weglikowska U, Hrncarikova K, Roth S. Effect of chemical treatment on electrical conductivity, infrared absorption, and Raman spectra of single-walled carbon nanotubes. J Phys Chem B. 2005;109(15):7174–7181. Chauvet O, Benoit JM, Corraze B. Electrical, magneto-transport and localization of charge carriers in nanocomposites based on carbon nanotubes. Carbon. 2004;42(5–6):949–952. Chen H, Muthuraman H, Stokes P, et al. Dispersion of carbon nanotubes and polymer nanocomposite fabrication using trifluoroacetic acid as a co-solvent. Nanotechnol. 2007;18(41). Liu CX, Choi JW. Improved dispersion of carbon nanotubes in polymers at high concentrations. Nanomaterials. 2012;2(4):329–347. Kalakonda P, Cabrera Y, Judith R, Georgiev GY, Cebe P, Iannacchione GS. Studies of electrical and thermal conductivities of sheared multi-walled carbon nanotube with isotactic polypropylene polymer composites. Nanomaterials and Nanotechnology. 2013;(5):1–7. Kohlmeyer RR, Javadi A, Pradhan B, et al. Electrical and dielectric properties of hydroxylated carbon nanotube-elastomer composites. J Phys Chem C. 2009;113(41):17626–17629. Rajendran S, Uma T. Effect of ceramic oxide on PMMA based polymer electrolyte systems. Mater Lett. 2000;45(3–4):191–196. Rajendran S, Uma T. Lithium ion conduction in PVC-LiBF4 electrolytes gelled with PMMA. J Power Sources. 2000;88(2):282–285. Wei Y, Kong LT, Yang R, Wang L, Liu JH, Huang XJ. Electrochemical impedance determination of polychlorinated biphenyl using a pyrenecyclodextrin-decorated single-walled carbon nanotube hybrid. Chem Commun (Camb). 2011;47(18):5340–5342. Vukovic GD, Marinkovic AD, Skapin SD, et al. Removal of lead from water by amino modified multi-walled carbon nanotubes. Chem Eng J. 2011;173(3):855–865. Kalakonda P, Iannacchione GS, Daly M, et al. Calorimetric study of nanocomposites of multiwalled carbon nanotubes and isotactic polypropylene polymer. J Appl Polym Sci. 2013;130:587–594.